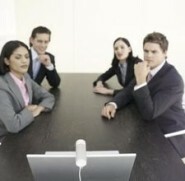 I read somewhere at net that with latest high tech equipments Video conferencing would become like a virtual visuals.People can feel while talking that they in front of the person whom they discussing.Really technology changing rapidly. Thnks for sharing this Video……..Nice.Such an informstive video.And Really Such a nice Blog. Such a nice Video…………………..It’s really Nice Video………..as well as an informative Blog …………………..Not should do inactivity during the Video Conferencing……. These what not to do in video conference is somehow related to what not to do when writing. Like your attention must be focus to what you are doing.